A primary objective for health care professionals is to establish solid, trusting relationships with patients in order to promote healthier behaviors. 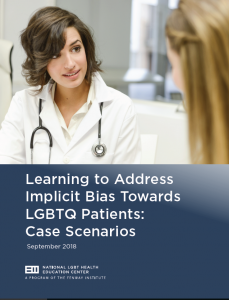 As with other minority groups, when working with lesbian, gay, bisexual, transgender, and queer (LGBTQ) patients, it is especially important to build rapport as a way to counteract the exclusion, discrimination, and stigma that many have experienced previously in health care. Despite our best intentions, however, internal –or implicit–biases may affect the way we talk to and behave with patients. For health care professionals, biases can lead to inequitable care, either through biased clinical decisions, or through communicating bias in conversation with patients.